Digging through some photos I thought had been lost with a computer changeover, several computers ago, I came across my arcade projects folders. 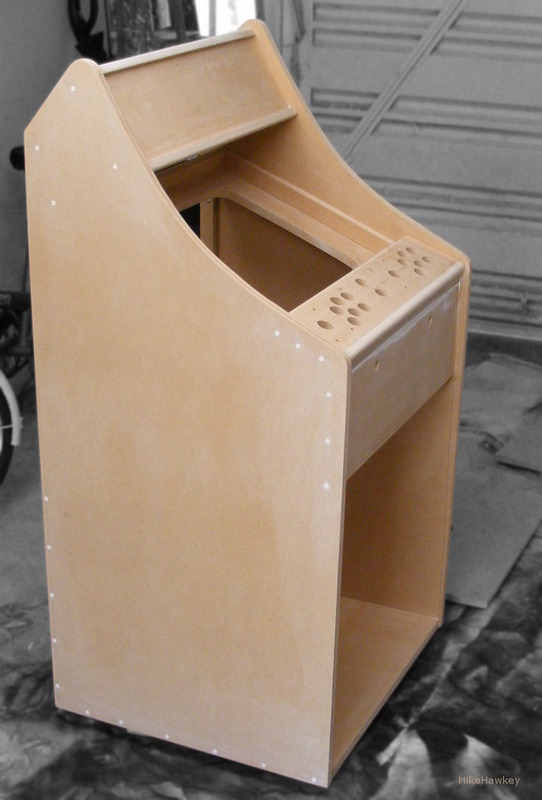 All in all I have build 5 arcade machines to date. Two full standing, two bar top and one mini tabletop unit. Todays image, loosely based on an Aussie Lowboy, was my first. Built from the ground up with MDF, running a CRT and using Mame. For me arcade machines made up a big part of my younger years gaming. Home systems were nice, but never as advanced as the games at ones local corner dairy. 20 cents would get you a round of ‘The Main Event’, ‘WWF’, ‘Double Dragon’, ‘Golden Axe’…the list goes on. Of course then came ‘Street Fighter 2’ and all of its roll offs (then 40 cents). Generally a pile of recognisable guys, all battling it out on the arcades, arguing over secret moves, boasting high scores and ocassionally asking for ‘secondies’ (ones second life). Having ones own at home brings back such memories. The games are just as addictive as they once were, but certainly a step back graphics wise compared to todays units. I love that low boy cabinet! Do you have plans our dimensions for it?